To provide accessible, quality, and culturally sensitive healthcare. Embracing healthy living to heal, to respect, to console. 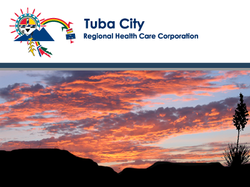 Tuba City Regional Health Care Corporation, a Joint Commission accredited health center, provides services to a 4,400 square mile area and serves as a referral center for the western part of the Navajo and Hopi Reservations. The Tuba City Regional Health Care Corporation is located in Northeast Arizona on the land known as the Colorado Plateau. This semi-desert landscape varies in elevation from 4,400 in the Little Colorado River Valley to nearly 7,000 feet at Preston Mesa.